I initially had reservations about reading Nevermore. The cover totally creeped me out, and that was enough to keep me away. Luckily, I was smart enough to listen to my lovely readers who told me that I had to read this book. I read it over a year ago and I STILL think about it some times! 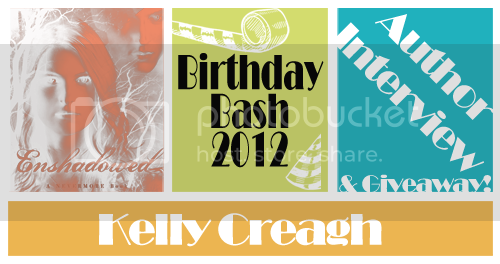 I'm so thrilled to be featuring Kelly today, only three days after the sequel to Nevermore has been released! Read on to see how cool she is, then enter to win the first book in the series! From what I’ve read it seems like Poe was something you didn’t really discover until after you began writing Nevermore. Was your original intent to make the book more realistic, or did you always think that it would have some fantastical/supernatural elements? It’s true that when I began Nevermore, I didn’t intend Poe to be a large part of the novel. He wasn’t even in my brain when I began. My idea consisted of a goth boy and a cheerleader being paired for a literature project. I knew that Varen carried a sketchbook and I also knew that the strange things he wrote about and drew in its pages would eventually come to life and terrorize Isobel. That was all the initial story seed consisted of. When Mr. Swanson paired Isobel and Varen together, I tried to think of what literary figure the goth boy might pick for the project and Poe seemed a logical choice. I began to brush up on Poe and research him a bit. That’s how I discovered the odd circumstances surrounding his death. Ideas began to bubble up and I had this burning desire to go to Baltimore where Poe once lived and is currently buried. So in 2006, a year after I began the novel, I went to visit his house and gravesite. The novel kept coming along and Poe became its backbone. There are even elements to the story that I look back on now that I realize weren’t conscious Poe-related decisions but now, in retrospect, seem to scream “Poe.” For example the bookshop owner of Nobit’s Nook has a glass eye. Though I had read the short story The Tell-Tale Heart, I wasn’t thinking about the old man with the vulture eye in that story when I wrote the character Bruce Nobit. It wasn’t until after I’d written most of the book that I realized that his eye had to have been a choice made by my subconscious. I think Nevermore has a lot of these little moments because I immersed myself in Poe’s works while writing. I listened to audio versions of his stories over and over. That said, Nevermore also contains many many conscious Poe links, such as Varen’s name which is an anagram for Raven. Also, some of the adults in the book have bird related names, like Mr. Swanson and Principal Finch. I named Varen’s street St. Francis Court because St. Francis was known for preaching to the birds. I love slipping in little tiny things like that. Were there any authors that did influence your work previous to Poe? My favorite authors are Susan Kay (author of Phantom) and Robin McKinley. I’m also a huge fan of Libba Bray and J.K. Rowling. I think I learned a lot about craft from those authors as well as how to construct a story. Also Gaston Leroux who wrote The Phantom of the Opera has been a large influence on my work. And that’s funny because Leroux was a huge fan of Poe. That’s why Leroux chose to have the Phantom appear at the Masquerade as The Red Death. That was Leroux’s nod to Poe’s. Ironically, my love for Leroux’s tale led to the choice of Varen wearing the phantom’s mask at the Grim Façade. That was my nod to Leroux. If there is one other person who I would name as a direct influence on my work, I would say Tim Burton. I’ve noticed that there are a TON of authors that have a theatre background. I know some people find this strange because writing seems like a very “introverted” career. How do you think theatre comes into play being an author? Do you ever get lonely while writing? I once heard someone say “Actors are frustrated writers.” But I actually think this goes the other way, too. I think that acting and writing are both forms of storytelling and that’s why they have such a cross-over allure. Actually, both of Poe’s parents were actors. When Poe used to give readings of The Raven in lecture halls and parlor parties, he would do so with dramatic flair, turning down the lamps in the room and performing the poem rather than just reciting it. With writing, instead of being confined to one character as an actor would be, I get to play them all in addition to making up the story all on my own. I think writing and acting are both forms of drama. So it makes total sense to me that many actors would also find joy in writing and vice versa. I’m always curious to know whether or not authors read what they write, or read things in completely different genres. What do you read? Have you ever had trouble with getting another author’s “voice” stuck in your head? I’m always reading and I try to read in a wide range of genres, though I tend to lean toward paranormal fiction since that is what I enjoy most as a reader. Mostly, though, I love a good story. Also, I listen to a lot of audio books because I enjoy drawing or painting or cleaning at the same time. It’s been a while since Nevermore came out. How do you suggest fans prepare for Enshadowed? Re-read Nevermore? Or perhaps read some Poe stories or poems? Though re-reading Nevermore might be a good idea, I don’t think that’s a must. I did my best in Enshadowed to include small reminders and recaps as to what happened in book one. If you were going to read something of Poe’s, I would definitely suggest The Fall of the House of Usher. Most definitely The Fall of the House of Usher. Along those same lines, do you know if there will ever be an audio edition of Nevermore? And then just for fun: What’s the weirdest thing you can see RIGHT NOW? Hm. I’m in a coffee shop at the moment. Looking…looking… um. That would be the man sitting across from me who just started talking to himself. OMG. Now he’s singing to himself, like “bum bum bum bum buuum.” Oh wow, now he’s singing all high pitched. I think it might be opera. I am so serious, he’s like crooning. He probably doesn’t know I can hear him because I have my headphones on… Funny that he didn’t start acting weird until you told me to look for something weird—GAH! Now he’s looking this way!!! Um… did I just fall into one of my books??? Last but not least, I love doing mad-libs with authors. Credit for the idea goes to, you guessed it, the reviewers at Everead! Everything was catapulting out in bizarre motion again. Varen’s cat lingered on hers even as he skated away. She watched him as one ghostly hand reached outlandishly into an opera singer behind the counter and pulled from a trough of water a single violet gravestone. You can win a copy of Nevermore! Today's giveaway is hosted by Girls PWN. Head on over to win. This giveaway is open TO US ONLY! I love Nevermore and I'm eagerly awaiting Enshadowed! Darn mailman for not bringing it to me sooner! What an amazing book. I love Edgar Allan Poe. I was going to pass on this book, it didn't seem like my type of book. But now I'm slightly intrigued. Great interview! I love Nevermore and can't wait to read Enshadowed! Great interview! I've been wanting to read NEVERMORE for a long time! I JUST picked up Nevermore from the library right before this interview! I hadn't heard of it before; but I'm almost finished with it now and I'm LOVING it!!! That perfect mixture of creepy and romantic and "Oooh what's going to happen next" and humor and yeah. I'm loving it. Plus...Varen.... *swoon* And I'm sure that Pinfeathers and the Nocs are going in some of the most awesome mental-image-bad-guys ever category. Poe's stories are terrifying! I want to read this one. I love that you are giving away Nevermore...since I haven't started the series yet...If I am lucky enough to win I can start right at the beginning. I read this last year as an ebook and loved it! I'm definitely going to have to reread before Enshadowed, though. And I loved the interview! Amazing interview!! Goth and a cheerleader? fun! haha! Thanks for sharing! Cant wait to read Nevermore! I love how things evolved to include Poe more, and how Kelly has a theatre background. I feel like, having played a lot of characters, she'd be super-qualified to write really good characters. That's huge for me. I'm totally looking forward to reading this one! Great interview. Hmm I wonder who would be a good voice to doo an audio. 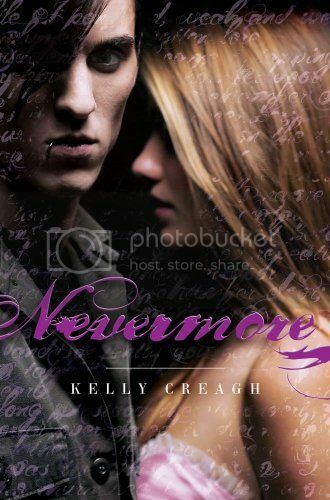 The cover for Nevermore is misleading to me. It gives the impression that this is about a clueless bubblegum-smacking airheaded girl. But that's not the case at all. Now the story inside is completely insane and magical!! !